Hot off the press! 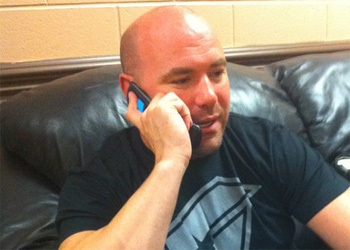 On Monday, UFC president Dana White briefly left his day job to write an opinion piece for TheNewYorkDailyNews. Now that mixed martial arts has once again passed through the New York State senate, as well as the Assembly’s Tourism, Parks, Arts and Sports Development with lopsided votes, White is putting the full-court press on before the Assembly casts their ballots on June 20th. The sport of MMA has been here before – exactly one year ago, as a matter of fact – with the Assembly ultimately crushing all hopes of an Octagon getting under Madison Square Garden’s famed spotlight. White highlighted the same pros that were brought up twelve months prior, but he also had the astronomical financial numbers that April’s UFC 129 show generated as an additional bullet point. If you’ve paid any attention to mixed martial arts over the past decade, you know the sport has exploded. It has the highest pay-per-view numbers of any sporting event, is broadcast on numerous cable, satellite and network television stations, enjoys mainstream sponsorships and has a large and diverse fan base. It is sanctioned in 45 of 48 U.S. states that have athletic commissions and across Canada and Australia. Unfortunately, MMA fans in New York are forced to enjoy the sport from afar. Here in New York, MMA is totally banned. It’s long past time to overturn that prohibition. It’s a safe and respectable sport that’s every bit as legitimate as boxing or professional football. I won’t pretend to be objective. I run the Ultimate Fighting Championship, the single most popular MMA promotion company. While I think that our fans here in New York and the city would profit immensely from legalization, it will also certainly affect my bottom line. But the benefits go far beyond my business. Bringing MMA to New York would make public policy sense in a city and state that need jobs and tax revenue badly. I understand some people think no amount of economic activity is worth selling the state’s soul – and some people insist that MMA is simply too brutal to allow. But MMA is completely different from the spectacle New York legislators banned back in the 1990s. When MMA first came to the United States, it was modeled after a Brazilian sport known as vale tudo – “anything goes.” Its early days were marked by a distinct lack of strong regulation – no weight classes, no time limits and no rules. In 2001, MMA reinvented itself. The Unified Rules of Mixed Martial Arts were written and adopted by the leading regulatory bodies working closely with promoters, including the UFC. The rules include provisions for weight classes, rounds and time limits. Dangerous maneuvers are totally outlawed. In the UFC, we have multiple ringside doctors at every fight, mandatory pre- and post-fight MRIs, comprehensive drug testing and a competitive atmosphere. If a fighter gets a concussion, he is forced to sit out of matches and training for a mandatory period determined by the regulatory body overseeing the event. No other professional sport has such strict concussion rules. All of those changes have produced two incredibly positive results: First, no athlete has suffered a serious injury in the history of UFC – nothing beyond a broken bone. Second, the sport has gained worldwide popularity and firmly established itself as the fastest-growing sport in the country. At this point, it’s very odd that New York would allow and even celebrate a sport like football, in which people have experienced serious and lasting physical injuries, and cling to the fiction that MMA is legalized assault. How successful would the sport be here? We got a taste a few weeks ago. A fight at the Rogers Centre in Toronto brought in ticket sales at the gate of more than $12 million – the largest for any event ever held at the arena. The sellout crowd of more than 55,000 – bigger than when an NFL game was held there – poured in to the city early and stayed late, purchasing arena concessions, staying in hotel rooms, dining at restaurants and taking taxis. I am positive that an event in New York would have the same kind of success. While Madison Square Garden is obviously a pinnacle for any sport, we have a large fan base in cities like Buffalo, Syracuse, Rochester and Albany, all of which could use the economic lift. We commissioned an economic impact study to demonstrate how much revenue one of our events would generate for the State of New York. The study, by HR & A, found that sanctioning MMA in New York City would generate more than $23 million in net new economic activity. In Buffalo, an event would generate $5.2 million in economic activity. Those figures assume only two UFC events, and we estimate we could do as many as three per year in New York State. Little wonder momentum is growing to overturn the ban. The state Senate recently voted overwhelmingly to sanction mixed martial arts and the Assembly’s tourism committee followed suit; now it’s time to allow a full Assembly vote. The sports capital of the world deserves access to one of the world’s fastest-growing sports, one that will bring money and jobs to state and local businesses.